Surrounded by her brood of 18 children, Nadezhda Osyak winces as she recalls the pain of childbirth: ‘It doesn’t get any easier. It’s called labour for a reason.’ Nadezhda is a youthful brunette in her early 50s whose trim figure belies her astonishing maternal accomplishments. ‘I gave birth to 15 naturally,’ she says, ‘and three by caesarean. Those three were like a holiday.’ She and her husband, Ioann, a priest in Russia’s Orthodox Church, had their first child in 1984, just before Mikhail Gorbachev came to power in the Soviet Union, and their 18th in 2009, by which time communism and the USSR were already distant memories. Their motive for having such a big family? ‘Love,’ says Father Ioann, patting his wife’s hand and gazing moistly at her while she blushes. A stout patriarch of 53 with a big grizzled beard, he’s someone for whom the word ‘uxorious’ might have been invented. The Osyaks are clearly exceptional by any standard. Anyone who is familiar with the parental treadmill of nappies, teething, Calpol and broken nights, who’s sat through Tikkabilla at 5am with a colicky child or coaxed a finicky infant into trying a spoonful of puréed sweet potato, will marvel at their achievements. But in Russia today, families like the Osyaks have an additional significance. It’s been clear to Russian policymakers for a while that their country is facing a demographic crisis. After the break up of the Soviet Union, the population of Russia shrank by up to 700,000 a year. Between 1992 and 2009, the country lost about six million people, or four per cent of its population. Suddenly, the endgame of Russian history seemed worryingly imminent – and it wasn’t a nuclear Armageddon. With too few live births to offset the death rate, the Russian population was simply slipping down the plughole of history. During the presidential-election campaign in 2012, Vladimir Putin sounded the alarm. ‘We are facing the risk of turning into an “empty space”,’ he warned, ‘whose fate will not be decided by us.’ It’s a dark and fascinating problem, with roots that go back at least to the terrible wounds of the Second World War, and the purges and man-made famine of the Soviet Union in the 1930s. But the government has suggested one simple potential solution: Russian parents need to make like the Osyaks and reproduce more. So far the government’s choice of aphrodisiac has been a combination of cash and propaganda. Since 2007, extra money has been given to parents on the birth of their second and third children. A special prize – the Order of Parental Glory – was established in 2008. Parents with seven or more children (biological or adopted) are invited to the Kremlin and receive the medal from the president himself. The Osyaks were among the first to get it. Nadezhda has fond memories of the ceremony. She was awarded her medal by President Dmitry Medvedev, during the four years when he occupied the Kremlin between episodes of Putin. People with long memories will recall a similar award being handed out in Soviet times to prolific parents. In fact, Father Ioann’s own mother was one recipient: he comes from a family of 18. But while the older Mrs Osyak was lauded for her fecundity, her religion was frowned upon in the zealously atheist atmosphere of the USSR. Father Ioann has many memories of religious intolerance. One that rankles especially is of his mother trying to buy some building materials for the family home and being turned away from a shop empty-handed. ‘God will help you,’ jeered the sales assistant. How times have changed. Today, the Osyaks live in an enormous house on the outskirts of the southern port city of Rostov-on-Don, handsomely appointed thanks to generous donations from some of the country’s richest people. The family’s change in fortunes has mirrored the nationwide resurgence of religion. Indeed, the Russian Orthodox Church and Putin’s government seem almost as enamoured of each other as Nadezhda and Ioann. Patriarch Kirill, the Church’s head, has cooed over Putin’s leadership, calling it ‘a miracle of God’. Despite Putin’s past as a member of the KGB – an organisation that persecuted priests and believers – Father Ioann also overflows with enthusiasm for the president. ‘This man is like a father, like my father; he takes care of every person in the country. He takes care of big families.’ The admiration is mutual: Putin is banking on big families to secure Russia’s future. 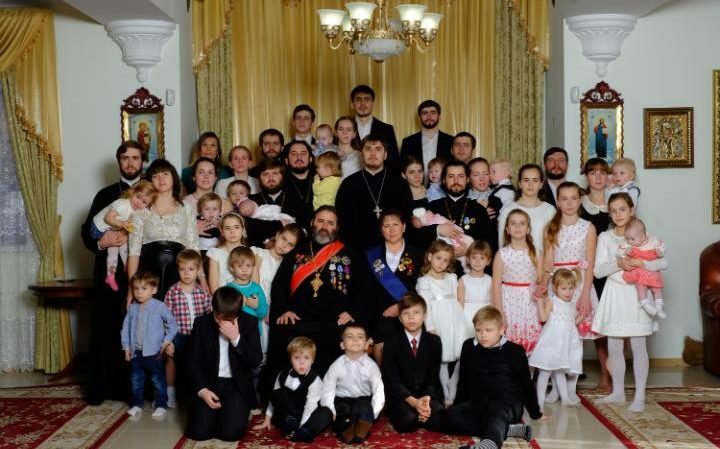 Father Sergei Krasnikov, 42, and his wife, Ekaterina, 37, have nine adopted children in addition to their seven biological ones. Following his example, congregants from his church in Rostov-on-Don have begun to adopt children with mental and physical disabilities. Father Sergei is of Don Cossack heritage, meaning he descends from the warrior clans who once defended Russia’s borders. He espouses a muscular version of Christianity, organising classes in Cossack culture and regular military training for the young people who attend his church. At one recent summer school, children eagerly undertook lessons in minesweeping, weapons handling and hand-to-hand combat. They may have some practical application: in Rostov-on-Don, the fighting in Ukraine is close enough to be occasionally audible. Father Ioann Osyak and his wife, Nadezhda, were among the first to receive the Order of Parental Glory. Awarded by the president, it is one of a raft of initiatives designed to boost Russia’s birth rate. 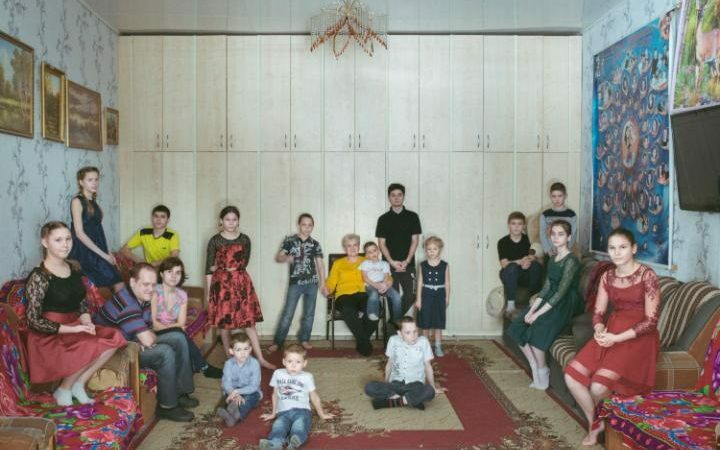 Father Ioann’s family suffered for their religion in the USSR, but in today’s Russia he has found himself an unlikely celebrity as the father of 18 children: eight girls (Olga, Elena, Maria, Tatyana, Anna, Nadezhda, Evdokia, Daria, Ksenia and Anastasia) and 10 boys (Ivan, Alexey, Evgeniy, Alexander, Vladimir, Grigoriy, Sergey and Serafim). Four of his sons have followed their father into the priesthood, and a fifth is studying at a seminary. The family’s values – religious, conservative, patriotic – are in tune with the mood of Russia’s government. Tatyana, 66, adopted her first child in 1975. Her late husband was an orphan and determined to spare as many children as possible from the experiences he endured growing up in a state-run orphanage. The Sorokins had two biological children and went on to adopt or foster 74. Tatyana calculates that, including grandchildren, there are 120 members of her immediate family. She currently has 17 children living with her. ‘You can put off everything until tomorrow, except for eating,’ she says, in a kitchen hung with drying laundry. Around her, her children take turns to eat at the table. Her newest arrival, five-year-old Kolya, has been with her for two months. He’s settling in after having been rejected by a previous adoptive family. As we speak, she is waiting to hear about three more children whom she hopes to adopt from a children’s home in Irkutsk, in Eastern Siberia. Some of Tatyana’s children belong to the category known in Russia as ‘social orphans’: a classification that applies to those with parents who are living but unable to cope. The former lives of the children she has adopted are like a catalogue of Russia’s chronic social problems: poverty, drug addiction, alcoholism. Increasingly, religion is being prescribed as the solution.